@dash I've been communicating with Crucial about this issue and you need to use Rufus to create the USB drive in order to boot using Legacy MBR mode. Make sure to select "ISO" mode when prompted. If you are using another utility, it needs to use a similar mode since "dd" mode or a direct bit for bit image is not working at this time. UEFI booting should work either way. I'm using k3b to burn the ISO, and the same problem appears on two different boxes. It says at boot : "could not find /boot/vmlinuz64". Does anyone know what "Status code 3" means after a failed update? Thanks! If this firmware update does not fix this, I will be sure to try that out - I am running CentOS7 btw - not FreeNAS - I just used that link since the FreeNAS guys noticed the same things I did. It would be great if Micron offered insight on this. So I started updating some MX500 drives - around 40 drives were updated to this new firmware release. 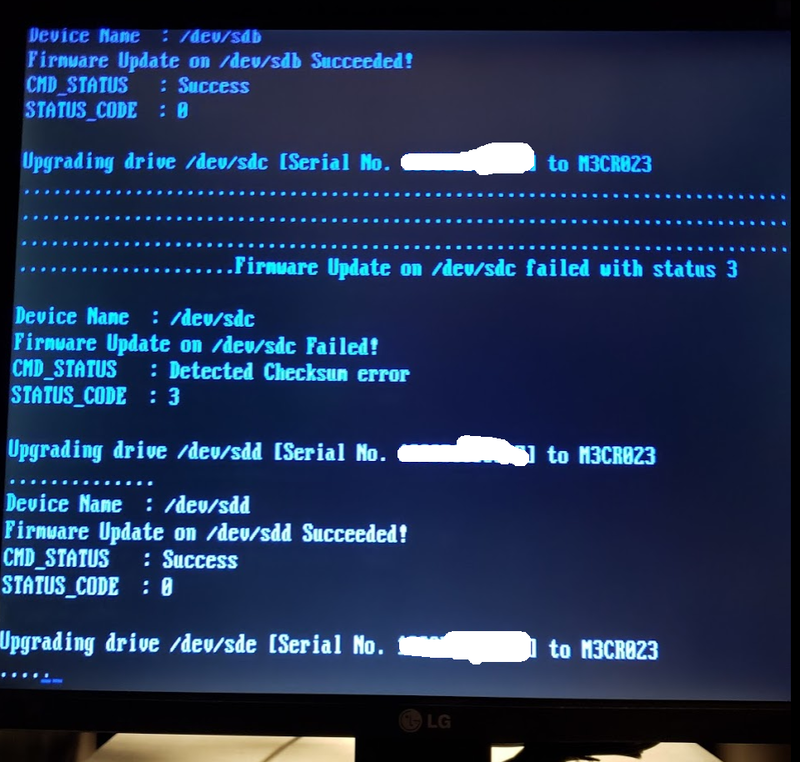 The ISO boot tool (a convenient way to update multiple drives in the same system), showed an error on just one of the drives while attemptiing to update the firmware (the rest all got success status). That error is in the photo below. Upon attempting to run the update again on the same drive - it reported it was already updated. Querying that dirve via smarctl shows it is now running the updated firmware (output below). But it had that checksum error - what to do! Should I attempt to reflash using Micron's CLI tool? Just assume everything went ok? Perhaps someone knowledgeable from Crucial/Micron could chime in on this scenario. It won't even boot in UEFI mode. I have linux machine and try to install update from USB stick. I used isohybrid utility on ISO to boot it in legacy mode which worked perfect for me with previous firmware update but now it won't. Did anyone managed to install this firmware from ISO on linux yet? @zwir Legacy MBR boot mode is broken on the current MX500 updater if you use "dd" to create the USB drive. According to a Crucial agent if you create the USB drive with Rufus and select ISO mode it will work. If your system is capable of UEFI booting, make sure UEFI is enabled and Secure Boot is off, then when you power on your system enter into the BIOS/UEFI boot menu during POST and select the UEFI USB option. Make sure to return the BIOS/UEFI settings to their original settings so it doesn't interfere with booting the OS on the SSD (although Linux is a bit more forgiving than Windows in this regard). If you cannot boot in UEFI mode, I can provide instructions to remaster the updater to work for Legacy booting. I am in contact with a Crucial agent so hopefully the Engineers will be able to replace the current ISO. @HWTech Thanks for response. I'm not very advanced user and I don't know how complicated this "remastering" could be but can try. If ISO will be replaced soon I might wait as well, no sweat. Anyway it seems to boot fine in legacy mode only I gets this "could not find /boot/vmlinuz64" error. Is that what you mean by broken updater or it's different issue maybe? Yes, you get that error if you transfer the ISO bit for bit to a USB drive. There may be a way around it since Rufus supposedly does it, but I don't know. I don't know if Unetbootin is able to do it or not. I expect Crucial to remedy this, but if you cannot wait just let me know. I too would like to know what to do regarding the FAILED UPDATE & Status code 3. Should you attempt to reflash the drive using Micron's CLI tool?